Wi-Fi video doorbells, also know as door viewers, are smart devices that let you know who's at your door whether you're at home, at work or on the go. They are usually equipped with a video camera, a microphone and a speaker that allow you to see, hear and speak to your visitor from wherever you may be, by streaming live audio and video of your home's front doorstep directly to the free iOS or Android app on your smartphone or tablet. Some units also record the activity in front of the door into the Cloud, so you can access and view the recording anytime. Note that these Wi-Fi doorbells do not allow unlocking the door remotely using the smartphone app. This is understandable from a security point of view, as in general it would be insecure to unlock a door unless you are physically there by the door. These smart doorbells are usually quick and easy to set up, and they are either powered by battery or through your existing doorbell wires. With certain brands both options are available. Important Note: If you power the device by connecting it to your existing doorbell wires, the existing doorbell chime will ring as usual. If the device is not connected to the existing doorbell's wires, the existing doorbell's chime no longer rings in the house, and it will only ring on the smartphone/tablet. Another advantage to wiring the device to your existing doorbell wires is that the device will always stay charged. The Wi-Fi video doorbells we will consider here are also equipped with motion sensors that detect activity in front of the door, and even when the visitor does not press the bell, an alert is sent to your smartphone or tablet to report the activity. Again, some units record the activity into the Cloud. Once the unit is installed, all you need to do to get it working is to sync it with your home's Wi-Fi, so it can connect to Internet. The syncing procedure takes seconds and is described in the documentation that comes with these doorbells. Multiple iOS or Android smartphones/tablets can be used with each of these devices. This article will compare the Ring, Ring Pro, SkyBell and SkyBell HD Wi-Fi video doorbells. These were not just the most popular among Amazon customers at the time this article was written, but they are also the best available currently on the market. Selected Wi-Fi Door Viewers on Amazon. You can see the visitor at the door and speak with the visitor using your smartphone or tablet, whether you're at home or across town. Ring & Ring Pro: Optional Cloud recording will capture every activity detected by the device sensors. The HD video recorded and securely stored in the cloud can be reviewed instantly or later using the Ring app. Cloud recording is optional and, at the time of this writing, it was offered for just $3/month or $30/annually. SkyBell HD: Cloud recording is free and will capture every activity detected by the device. The HD video recorded and securely stored in the cloud can be reviewed instantly or later using the SkyBell app. Note: By Cloud recording we mean that the videos are recorded to a particular website belonging to either to Ring or SkyBell. The motion sensor found both on Ring and SkyBell doorbells trigger alerts via the smartphone/tablet app when activity is sensed even when the doorbell is not pressed. When an alert is received, you can request a live view of your home’s front door. In addition, Cloud recording ensures you'll never miss any activity at your home’s door. This feature found on the Ring Pro app allows drawing and creating custom shaped motion zones, so that you get alerted about what matters most. This feature allows to view your home’s front door even when no one is there or no alert has been received. This feature allows to turn off your home's doorbell chime from the app and only receive alerts on the mobile device (smartphone/tablet). Quite a useful feature when someone is asleep at home. Note that the doorbell must be hardwired for this feature to work. When the original Ring doorbell is used with the battery and is not hardwired, this feature will not be available. Ring can be powered using the built-in rechargeable battery, or using your existing doorbell’s power wiring. When existing doorbell wiring is used, there are two transformers on the mounting bracket that allow easy connection with either a digital or mechanical doorbell chime. Ring Pro must be hardwired to your existing doorbell's power wires. No batteries are used. SkyBell and SkyBell HD do not use any batteries either. You basically attach them to the existing doorbell's power wires as long as the existing doorbell chime is mechanical. If the existing doorbell chime is not mechanical but digital, you have to buy a separate piece of hardware called a digital doorbell adapter (essentially a 10 ohm/10-watt resistor) for a connection between SkyBell and power source. Both Rain and SkyBell are designed to work in harsh environments including heat, rain, snow and humidity, but they should not be submerged in water. Ring and Ring Pro can operate in temperatures from -5F to +120F. SkyBell and SkyBell HD can operate in temperatures from -40F to +140F. With Ring, if you prefer to use the battery powering mode, installation is really a breeze. But even when you prefer the wired option, the job is very simple: there are two transformers on the mounting bracket to allow for easy connection with either a digital or mechanical doorbell chime. The device comes with everything you need to install in minutes on any surface, including an installation instruction video. Note that if the battery power method is chosen and the device is not connected to the existing doorbell's wires, then the existing doorbell's chime no longer rings in the house, and you are only alerted on the smartphone. With Ring Pro there is no battery and the device must be connected to the existing hardwired doorbell. Once again, the device comes with everything you need to install in minutes on any surface. With SkyBell and SkyBell HD, there is no battery either, and you need to know how to hardwire the device to the existing doorbell’s power wires. You need to follow carefully the installation instructions, but note that if the existing doorbell chime is not mechanical, but digital, you will have to buy a separate piece of hardware called a digital doorbell adapter. Also note that SkyBell is not compatible with wireless doorbell chimes or intercom systems. Ring is offered in Venetian Bronze, Polished Brass, Antique Brass and Satin Nickel. Ring Pro comes with four interchangeable faceplates included in your purchase. You can choose between Satin Black, Venetian, Satin Nickel and Pearl White to customize your doorbell to match your home. SkyBell and SkyBell Pro are offered in Silver and Bronze. Bot devices come with a 1-year warranty. In addition, both brands also provide protection against theft of the unit: if your doorbell gets stolen, they will replace it for free, as long as there is sufficient proof that it was indeed stolen. The list prices shown were in effect at the time this article was written and may have changed. For exact prices, please refer to the Amazon products section below. Note that the Amazon price often includes a generous discount to the list price. If a discount exists, both the Amazon price and the list price will be displayed when you click the Amazon product link images below. Though the four video doorbells considered here are quite popular among Amazon customers, at the time this article was written, Ring and Ring Pro had received better average ratings from Amazon customers than the SkyBell units (an average rating of 4 stars for the Ring products vs. 3 stars for the SkyBell devices, at the time this article was written). 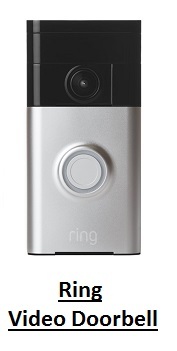 Note also that Ring Pro was the best seller in the Wi-Fi Video Doorbell category. One aspect of the service offered by SkyBell we like is that Cloud recording is free, where as there is a small cost per month for Ring if Cloud recording is desired. On the other hand, Ring Pro supports 5 GHZ Wi-Fi whereas the SkyBell units support only 2.4 GHz Wi-Fi. 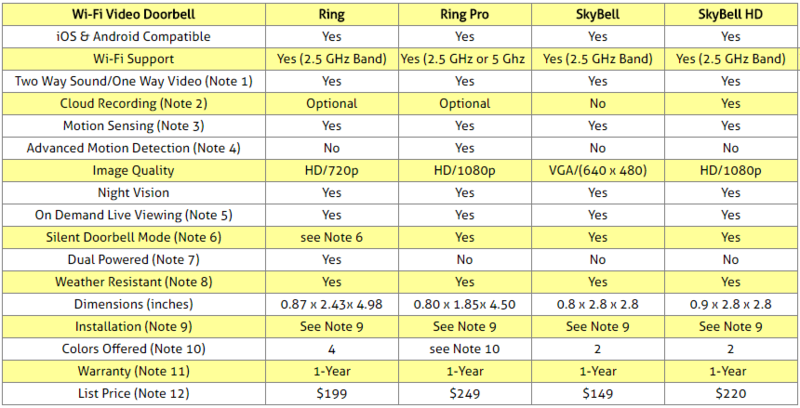 Other than that, the functionality offered by the latest versions of these devices (namely, Ring Pro and SkyBell HD) are quite similar as it can be observed from the above comparison table. If the installation is properly done, and you are integrating the product into a network with adequate router, internet speed and bandwidth, you should be quite happy with either device, just like the many Amazon customers who have written positive reviews. It is quite important to follow carefully the installation instructions so that problems such as delayed alerts and blanked screens that certain reviewers have reported are avoided. The battery is removable without having to take the entire Ring device off of the wall. ​Two face plates are included (silver and black). Video quality is improved: 1080 HD. You will find below links for both the original RING Video Doorbell and RING Video Doorbel 2, as well as for RING Pro Video Doorbell.